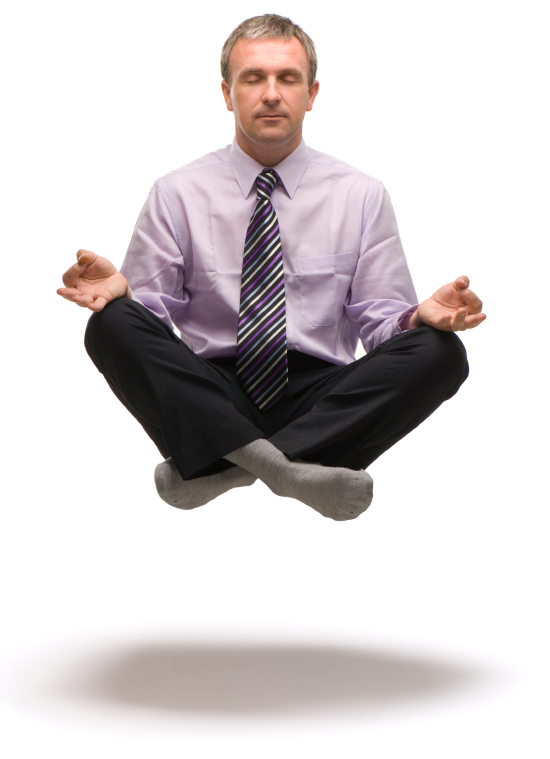 Corporate Buddha meditates under a tax shelter. SEARCH INSIDE YOURSELF is a Zen-like curriculum in “emotional intelligence” that has been taught at Google University to Google employees since 2007. Its central concept is “mindfulness,” a kind of serenely focused attention, and it consists in a series of meditations and mind-body exercises—“wisdom practices in a corporate setting”—that are designed to enhance “stellar work performance, outstanding leadership, and the ability to create the conditions for happiness.” The irony of refining the attention of people whose business is to disperse and even destroy attention is of course lost on Meng, who soulfully includes a prescription for “mindful e-mailing” (“begin by taking one conscious breath …”). Meng does a meditation “every time I walk from my office to the restroom and back.” The restroom, indeed. “Mindfulness,” he explains, “is the mind of just being. All you really need to do is to pay attention moment-to-moment without judging. It is that simple.” (The denial of significant complexity is inscribed in the book’s vrai-naïf style: “Difficult conversations are conversations that are hard to have.”) Owing to Meng’s course, employees at Google get promoted, come to work more often, and have fun. As an example of someone who grasps that “your work is something you do for fun,” he gives—in one of the many unself-aware passages in this manual of self-awareness—Warren Buffett. More than fun, “your work will become a source of your happiness.” And of the company’s happiness, too. I am pretty sure that Siddhartha did not meditate under a bodhi tree so that corporations can train their workers to be “non-judgemental” and “present”. The article gets at a fundamental shift taking place in American society: the workplace has become people’s entire lives. Corporations like Google are training their workers to find spiritual fulfillment within the work place, making things like a social life and a family superfluous. If one has to work 80 hours a week in order to get ahead in the company or, more commonly, to merely maintain their position, then there really is no room to have a family. The man humbles himself so that he may be exalted. The engineers in Silicon Valley merely reflect the leading edge of a trend that has been overtaking the entire workforce. Whether one works 80 hours a week or not, those of us who work for a living are having our entire lives dominated by who signs our checks. With employees being asked for the passwords to their Facebook accounts, or teachers being terminated for what they say on personal time, the American worker has had their civil rights trumped by the prerogatives of employers. The workplace has become the centerpiece of our entire existence. In Silicon Valley, where workers are at least decently compensated for their work, we see a scary sanctimony that seems to be becoming more pervasive among the members of the 1 percent. Being non-judgmental is just plain stupid. Judgement is a fundamental human capacity, something that exercises the more advanced reaches of our brains. One of the first things I tell my classes at the start of the year is that they will be doing a lot of judging. They will have to analyze evidence and information in order to come to inductive answers to questions. It is sad that this non-judgemental craze has taken public schools by storm over the past 20 years. Kids are trained from kindergarten to not judge or to be “tolerant”. It is designed to have the same impact on them that this faux-Buddhism has on Silicon Valley workers: to silence their inner moral voice in hopes of fostering “group think”. Everything everyone says is great. Every idea is equally valid because, after all, who are we to judge? This is why so many pernicious and destructive ideas are so easily accepted in the United States. We have been trained to subdue our critical, questioning side. Evolutionists and Creationists, Democrats and Republicans, everyone’s ideas are “equal”. Yet, when the richies are seized by this idea, it is accompanied by an insufferable do-gooder mindset that paves the path to hell. The article describes Google engineers who are so enthralled with their own enlightenment that they believe whatever services they market to the people must be good. After all, it was designed by “present”, “non-judgemental” people, so the product must be totally benign. This is the same mindset that runs through all of the education reformers. Whether it is Bill Gates or Salman Khan (is it a coincidence that both of these guys have ties to Silicon Valley? ), there is a sanctimonious sense that they truly believe they are working for some higher purpose. And what about those who disagree with their ideas? Oh, they are just judgemental and petty. They are motivated by selfish ends, like those teacher unions who only look out for themselves. Our morals are superior, so it is justified that we roll right over all critics and protests without a second thought. Do these people not understand that we are trying to save the world? The scariest people are the ones who are the most convinced of the righteousness of their cause. Sycophants are not only found in religious circles. They are found in Silicon Valley, where people believe they have reached Nirvana. They are found in liberal circles, where cultural identity issues merely mask the class oppression upon which wealth for the few is sustained. They are found on Wall Street, where the religion of economics inoculates even the brightest day-trader to the fundamental destruction wrought by their actions. Beware of rich people bearing gifts. After they tyrannize their own souls, they will stop at nothing to tyrannize all of ours. This entry was posted in An Embattled Career, education reform, Parallel Universes, Politics, School and tagged Class Inequality, Corporate Brain-Washing, economics, Education Reform, Google's Corporate Brainwashing, Group Think. Silicon Valley, Limousine Liberal, School. Bookmark the permalink. Part of the insidiousness of companies using these mystifications is the primary motive of having employees internalize management’s goals and ideology, all tarted up with New Age/Human Potential Movement cliches. Sadly, it works far too often, as there seems to be a set percentage of the population that is particularly receptive to this Stepford Wives conformity. Charter schools and corporate education reformers have their own mantras: choice, no excuses, all that matters for children of poverty is that they have “great teachers,” etc, and with the same scripted, hollow content. Just try this b.s. curriculum – and you must buy into it – otherwise it won’t work! In math reform they say “trust the spiral.” Give it a few years – it will work – pay no attention to the man behind the curtain!